This book introduces the reader to the principles of assessment of student learning outcomes in the context of program review, and illustrates how to implement a sustainable outcomes-based assessment program review process based on over 30 case studies of exemplary practice across a range of institutional types. Since publication of the first edition just over a decade ago, the landscape of higher education has been transformed. With the emergence of competency-based education, the questioning of the value of a post-secondary degree, the explosion of neuroscientific research, the emphasis on metacognition, as well as demographic changes in who is going to college and why, new questions are being asked and new methods of collecting data have multiplied. This new edition retains the goals of the first--which is to inform institutional self-reflection of how well the organization is achieving its intended purpose--in a manner that is reflective, adaptive, and collaborative, but which recognizes today’s changed environment. Among the new topics Marilee J. Bresciani Ludvik introduces in this edition is how to appropriately connect outcomes-based program review (OBPR) to performance indicators and predictive analytics and develop meaningful new performance metrics to inform our understanding of the student experience. She also addresses the intersection of OBPR with competency-based assessment, introduces the reader to new concepts and terminology, and demonstrates the implications of neuroscientific research for learning and development and how that influences OBPR design. All the cases, a signature feature of the first edition to illustrate best practice, have been replaced for this edition. Bresciani Ludvik postulates the importance of developing institutions as learning organizations where OBPR is designed collaboratively between student services, academic services, business services professionals, and faculty. Each chapter concludes with key learning points as well as questions for organizational leadership to promote ongoing professional development as institutions implement OBPR practices that are appropriate for their specific contexts. “In the second edition of Marilee’s book on outcomes-based assessment program review, she brings a renewed focus to achievement for all students, as well as connections between outcomes conversations and predictive analytics along with other potentially performance enhancing technologies. While there is much debate about the role of technology in higher education, outcomes in general, the seemingly decreasing value of a degree, as well as the criteria upon which higher education should be judged and held accountable, Marilee’s book offers a breath of fresh air and a meaningful way forward. Viewing outcomes conversations as part of a learning organization that focuses upon asking ‘the right’ questions about our practice, she presents a non-prescriptive process focused on reflection, collaboration, and adaptability. She reminds us that it is through conversations, space, and time for reflection that we can foster processes not based in compliance, but in collecting, analyzing, and interpreting data in ways that matter to individual institutions. "The new edition of Outcomes-Based Program Review is a timely gift for higher education. Its emphasis on the science and the art of assessment, coupled with the overarching importance of evidence for learning – not simply demonstrated student learning but demonstrated organizational learning - is imperative and welcome. Every person at a higher education organization can locate some way to contribute to achieving enhanced student success through the clear, comprehensive guidance set forth." "Colleges and universities in the United States expanded rapidly in the twentieth century in response to the need to provide access to higher education and training to a greater percentage of an increasing population. While the most elite universities focused on scholarship and the production of knowledge, giving students an opportunity to learn was the most significant mission for most colleges and universities. However, the institutions took no responsibility for the learning and success of their students. A common philosophy in the 1960s was “students have a right to fail,” meaning colleges should give students a chance, but institutions have no responsibility for their success or failure—that was up to the student. Over the past thirty years, there has been a significant shift in the mission of higher education. Today’s colleges and universities are being asked to be accountable not only for access for students but also for outcomes including student learning, degree completion, and equity. Measuring success outcomes is much more difficult and controversial than measuring student enrollment, and the efforts have sometimes been contentious. 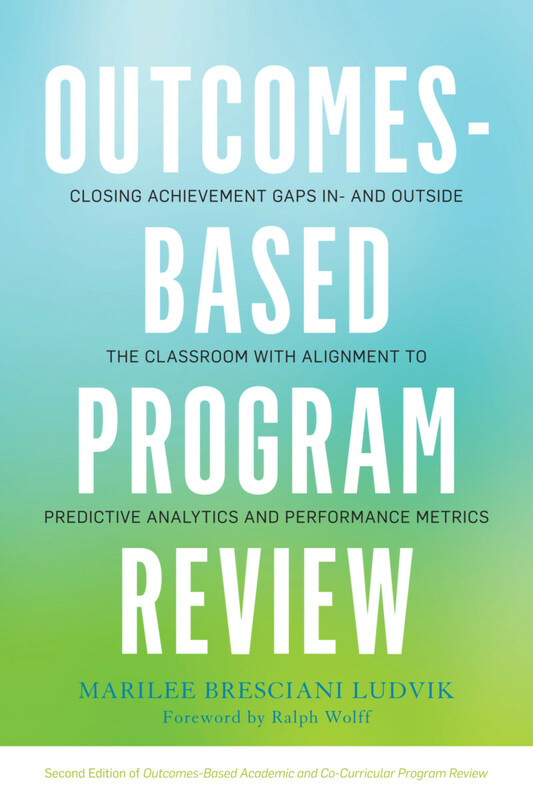 In the second edition of Outcomes-Based Program Review, Dr. Marilee Bresciani Ludvik provides roadmaps and lessons learned that can guide today’s educators in the use of data and predictive analytics to improve student success and to close achievement gaps. As Dr. Ludvik reminds us, as discussions about learning outcomes continue, educators should be careful not to fall into the trap of making their purpose just about a report to satisfy an accrediting commission or a state agency. Institutional improvement is much more important than mandated reports." "If our institutions of higher education are truly institutions of learning, we must dedicate ourselves to learning from our primary practice. We must seek to improve continuously the extent to which our programs generate evidence of learning. This splendid book is a great place to start." "Outcomes assessment in higher education is a magnet for criticism, in large part because too often the effort does not yield meaningful, actionable information. This refreshed volume is a timely antidote of sorts, distilling lessons learned about best practices from scores of schools doing assessment right to persuasively explain why and expertly illustrate how the essential work of collecting and using evidence of student learning can benefit students, faculty and staff, institutions, and the public." "For Ludvik the systematic and reflective inquiry process involved in developing a program review and the content of it are essential to an institution that has become or seeks to become a learning organization. Useful reviews developed according to Ludvik’s guidance and plethora of examples and resources provide lens through which institutional leaders can continuously explore how well the departments, programs, and services of their institution are achieving two major goals: (1) fulfillment of institutional mission and purposes at demonstrably high-quality levels and (2) preparation of all students to achieve the high-quality learning outcomes necessary to contribute to the demands of the 21st-Century. Ludvik’s second edition has now become THE most comprehensive resource for effectively developing institutionally useful program reviews at all levels across a college, university, or a system."